Size ………………………………. As per your requirements. Matching up with the requirements of our clients, we are involved in offering Magnesite Dunite. Olivine is a commercial source of magnesia combined with silica that is mainly used in metallurgy, fertilizer, etc. There is a rising trend in use of dunite and pyroxenite in sintering and as a fluxing agent in blast furnace in place of dolomite. ØOur organization has successfully been able to match the exact requirements of our clients to the finest level of perfection. We always deliver the precise specifications in accordance with the Magnesite Dunite. As per client requirement, we do the packaging of the product. Dunite, the parent rock of Magnesite contains 49% of MgO and 39% of SiO2 and the Magnesite is derived from the Dunite. It is dark Grey to Olive Green in colour. The total reserves available will be approximately. Different sizes are manufactured based on Customer requirements. 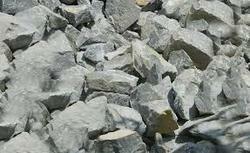 We bring forth high grade Dunite that complies with standards of quality. It is widely demanded in the market and brings high appreciation to the company for its purity. It is basically represent the refractory residue left after the extraction of basaltic magmas in the upper mantle. It is easily available in the market.